This is just fantastic! I know it's all about the racing, but sometimes it's not. Sometimes it's about the story. The Danica/Dan confrontation continues to reverberate, getting coverage throughout the country. Not only has provided a topic of discussion for shows on all you major sports networks, but I personally have had friends who don’t normally watch IndyCar racing ask my thoughts on the fracas “with Danica and that other driver” (and no, they didn’t catch who actually won the race in Milwaukee). Los Angeles Times: "Men are from Mars, women are from Andretti Green Racing." 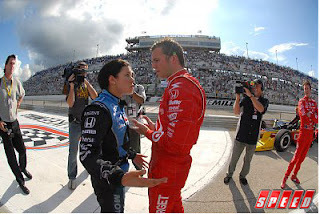 Indianapolis Star: "If Danica Patrick wants to get tough with Dan Wheldon, the former Indianapolis 500 winner is ready for it." Arizona Star: "I’d love to see those two go it. I bet there’d be a lot of hair-pulling." Edumnds Online (Edmunds? The auto site? Yes, even Edmunds! ): "Was Patrick crowded by Wheldon, or is she just showing the signs of pressure for her to succeed in the IRL? Your answer depends, probably, upon which driver you root for." Through their public relations representatives, both Wheldon and Patrick declined further comment on Monday. But that didn't prevent TMS' marketing department from launching a fight-themed advertising campaign -- "Rumble at the Speedway" -- heading into Saturday night's Bombardier Learjet 550. "I am dizzy from the giddiness from the moment I saw that [TV clip]," said TMS president Eddie Gossage. "That's pretty strong stuff, and we are developing a marketing campaign about the controversy that erupted between Danica Patrick and Dan Wheldon. The best promotion is something that occurs within the confines of the competition on the track. But when you're dealing with facts and statements on video that are colorful, if not inflammatory, you can't serve up a better promotion." Yeah, I know this little arm shove is completely overplayed – and I don’t care. People who otherwise wouldn’t know Dan Wheldon from Marty Feldman are talking about IndyCar racing with an excitement in their voice, and that’s all good to me. I don't care who is right or wrong. I love the drama. John would say, "This is so NASCAR." If we're lucky, and I mean really lucky, it will result in more sponsors -- for Danica. Give it to Goose Gossage for knowing a hook when he sees it. Any way we can get this guy on the job for all of the IRL? Check out the Iceman in the first photo. The look on his face makes the photo. Pulitzer nomination, please. Dan is totally milking this. He was just on ESPN live talking about it. I couldn't hear what he said because I was in a loud bar (natch) but it was obvious he was having a blast with it...and they had him on for quite a while. She picked the wrong guy to F with. Who does she think he is...Jacques Lazier? Pfft. I love it. Really. A lot. WHAT COMES AROUND GOES AROUND. EVERY TIME PATRICK GETS ON THE TRACK SHE CAUSES SOMEONE TO CRASH. SHE SHOULD BE BOOTED OUT OF RACEING INSTEAD OF GETTING SO MUCH PRESS TIME. SHE PUSHES TO HARD TO WIN AND BLAMES EVERYONE ELSE BECAUSE SHE CANT DRIVE. GO HOME DANICA AND STAY THERE. Remember...he's not Dan Wheldon. He's "the guy who won the Indy 500"
Dan would have been much manlier in his rebuttal if he wasn't drinking from a straw. I mean really people...who drinks from a straw? since i don't care much for either of them (even though Danica IS with AGR) I'm loving watching them act like idiots. I smell money comin' in to the IRL for this one. And yes, those who cared little about the IRL before, suddenly are into it now. See? all the IRL needed was some more he vs. she.